Yes! We encourage you to bring your friends and family to share this special moment with you. Children are also welcome and we provide them with plenty of toys and books to keep them entertained. At our Baytown, TX location our ultrasound room can comfortably seat 10 plus people, but more are welcome if they would like to stand and watch. The ultrasound is projected onto a 120 inch screen so that everyone is able to see with ease. It is our number one priority at Love at First Sight to obtain the absolute best images of your baby & make sure you are satisfied to the fullest. 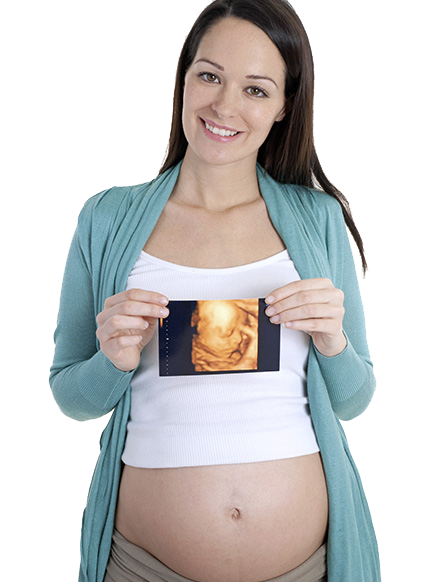 We use the top of the line ultrasound equipment to ensure this, however, some factors that determine the outcome of your ultrasound are out of our control such as: location of your placenta, the amount of amniotic fluid surrounding your baby, the clarity of the amniotic fluid, the baby's position, & the overall fetal environment. If we are unable to determine the gender of your child or obtain 3D/4D images at your scheduled appointment due to these factors mentioned above, you will be asked to reschedule & come back for a second appointment within the next 14 days at no charge.